Art, Architecture, Pedagogy: Experiments in Learning edited by artist Ken Ehrlich, is Viralnet.net's first book project. The publication was conceived by Ken Ehrlich as a project for his 2009 artist-in-residency with Viralnet.net. Ehrlich considers pedagogy in the realm of contemporary art and artistic practices, particularly in Los Angeles, that incorporates, negotiates and develops out of a variety of educational models and situations. The contributors reflect on a series of broad questions in both playful and scholarly terms: How does the physical structure and environment of an art school affect the pedagogical program? Can we imagine ideal environments or spaces for a contemporary art education? What are some of the prevailing assumptions about what art education should entail and what sorts of assumptions about pedagogy do specific environments presuppose? How do philosophies of architecture intersect with philosophies of art and arts pedagogy in the spaces of art schools? And perhaps most difficult to answer, what are students of contemporary art being trained to do? The book is structured around three themes: the architecture of art schools, experiments in pedagogy as artistic practice and theorization of the relationships between contemporary art and pedagogy. Janet Sarbanes writes about the storied history of CalArts, positioning its architecture somewhere between the ideology of the Bauhaus and Walt Disney. Patricia Morton reflects on the relatively new arts building at the University of California at Riverside and in doing so questions rigorous architecture's ability to feel comfortable. Tim Durfees graphic proposal's for expanding the territories of an art education occupy that slippery space between critique and idealism, addressing serious questions through playful suggestions. These proposals map an uncertain future at the same time they point to the redundancy of particular pedagogical conventions. The second section consists of contributions from students or organizers of pedagogical experiments in Los Angeles. E-mails between potential workshop teachers and the organizers at Machine Project provide insight into the idiosyncratic process that produces one of the more varied and dynamic pedagogical programs in Los Angeles. Katie Bachler provides a poetic account of her experiences as a student attending Sundown Schoolhouse, a project initiated by artist and architect Fritz Haeg. In a conversation format, one iteration of the revolving group of organizers at The Public School	discuss and speculate about the present and future of that experiment. Finally, the third section addresses the institutionalization of pedagogy as arts practice. Liam Gillick, in a text initially written for a temporary art school that was to take place during Manifesta 6, speculates about the evolving relationship between teacher and student in the context of teaching art. He suggest that the mentor – mentee model might be giving way to more fluid and challenging dynamics as students of art increasingly look outside of the field of art for an education. Pablo Helguera looks broadly at the history of pedagogy in relation to art practice and provides particular insights about the way that institutions – schools, museums, biennials – leverage pedagogical practices for very different purposes with very different effects. At a time when there is renewed interest in pedagogical strategies and a range of artistic practices engaged with questions around art and design education, the book looks critically at what it means to teach and learn and gives a platform for reflection to some of the most dynamic educational experiments at work in Los Angeles. Artists, architects, designers, students and educators, as well as a general audience, will find a diverse range of writing on the potential for art, architecture and pedagogy to inform one another in generative and surprising ways. 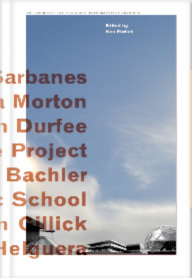 Art, Architecture, Pedagogy: Experiments in Learning edited by Ken Ehrlich with contributions by Janet Sarbanes, Patricia Morton, Tim Durfee, Machine Project, Katie Bachler, The Public School, Liam Gillick and Pablo Helguera.